Acer is courting home cinema users with its latest premium LCD monitor, the H235H. 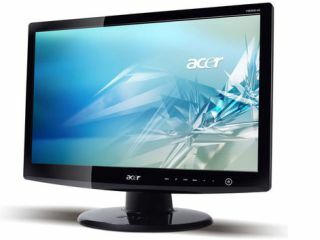 This 23-inch widescreen LCD provides features a 16:9 aspect ratio for maximum HD support and a 1920x1080 resolution. Gamers will enjoy the fast 2ms response time, and brightness (300 cd/m2) and contrast (100,000:1) are both respectable. We're not sure how often anyone actually changes their monitor settings (er, once?) but if you are a fiddler, you might like the Acer H235H's SensorTouch LED illuminated controls that "maintain the product's streamlined look, while automatically sensing contact with the lightest touch". Other features include support for VGA and HDMI as well as DVI with HDCP (High-Bandwidth Digital Content Protection) and 160-degree horizontal and vertical viewing angles. The monitor will be available in the US in July, with no word on price yet. Also launched today were new industrial designs for the Acer Aspire M5, M3 and X3 Series of desktop PCs. To be honest these don't look all that exciting - although there's more of the home cinema theme with a light-up optical drive button for swapping DVDs in the dark.